A benefit performance of the Young Vic’s sold-out show A Season in the Congo goes on sale today to raise vital funds for the people of the Democratic Republic of Congo (DRC). All monies made from the matinee performance at 2.30pm on Wednesday 14 August will go directly to support Oxfam’s work with Congolese refugees displaced by the current conflict. The Young Vic are hoping to raise £10,000; tickets will be sold at Young Vic prices, with an added top price band at £50. The production stars Olivier Award-winner Chiwetel Ejiofor as Patrice Lumumba, the first democratically elected prime minister of the Congo. Earlier this year, Chiwetel joined director Joe Wright and Young Vic artistic director David Lan on a research trip to DRC with Oxfam to visit the country that inspired Aimé Césaire’s epic drama which tells of this vibrant nation's turbulent first year of freedom. A Season in the Congo may be a historical play but its themes continue to reverberate today. In July 2013, tens of thousands of people fled DRC into Uganda after a rebel group attacked a town on the border of the East African country. People fled for their lives with very little and are in urgent need of basic supplies and services. Oxfam is working to provide water, sanitation and hygiene facilities for almost 18,000 refugees living in Bubukwanga camp, western Uganda. 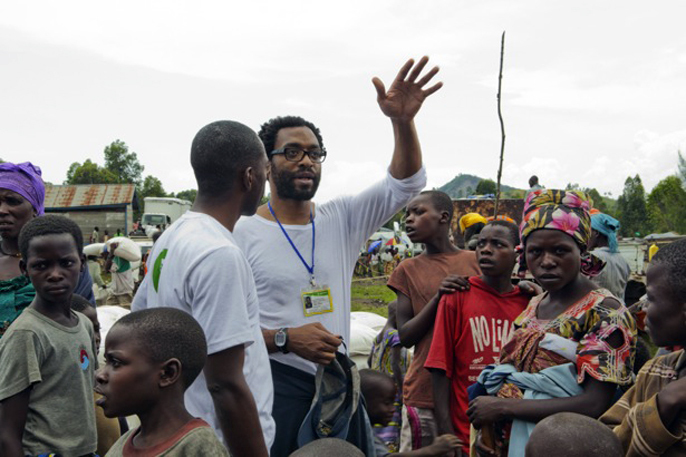 Chiwetel Ejiofor said: "Visiting some of the camps in DRC with Oxfam, I saw some of the bleakest things I’ve ever witnessed. Thousands upon thousands of people have fled their homes in the east of the country to escape violent rebel forces. It is the sheer scale of it that is almost incomprehensible. David Lan, Joe Wright and I were all deeply moved by this experience, and this fundraiser is just a small way for us to honour the families we met who are trying to live with dignity in desperate conditions"
Director, Joe Wright added: "Our trip to DRC was a life-changing experience. I've never had my heart broken as I did visiting the camps of refugee families. What I most remember now are the faces of the Congolese people we met, especially the children’s faces, thousands and thousands and thousands of them, lost, abandoned and forced to fend for themselves in the cruellest circumstances. There are more than two million people homeless and dispossessed due to the conflict in DRC, and in the week the play opened here in London, thousands more families were forced to flee their villages." Oxfam is delivering more than 70,000 litres of water to the camp in Uganda every day and has set up a water system to ensure refugees have safe access to clean water. Alongside other aid agencies, Oxfam is building toilets and bathing shelters, as well as promoting good hygiene practices. Any money raised by this benefit performance on 14 August will be channelled directly to this response.